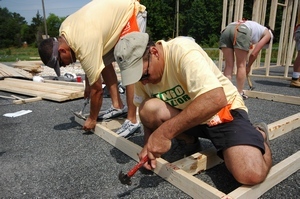 On Wednesday June 23 2010 in 90+ degree heat more than 70 local Sussex County Delaware Realtors came together to help frame a home in conjunction with Habitat for Humanity. As someone who has experience building homes it was fascinating to see people both young and old with absolutely no experience being as productive as they were. Small teams of five to eight members consistently banged out one wall after another hour after hour in the hot summer sun. What started out as large stacks of 2×4 lumber in the morning transformed into a good sized twinhome (duplex) by mid afternoon. You are welcome to view additional photos of the SCAOR Habitat for Humanity Summer Build on my facebook page.